Unique and interesting vintage wall clock. It is made of used vinyl records. Detailed information about the product: • We may change a clock dial for you for free • Clock movement works quiet and it will serve you for a very long time • The size our the clock is 12" • We pack our handmade clock in a separate protected box. It is included in the parcel. You can choose one of the templates developed by our professional designers or you can create your own design and we will implement it for you. The vintage vinyl record clock will suit to any design and interior. 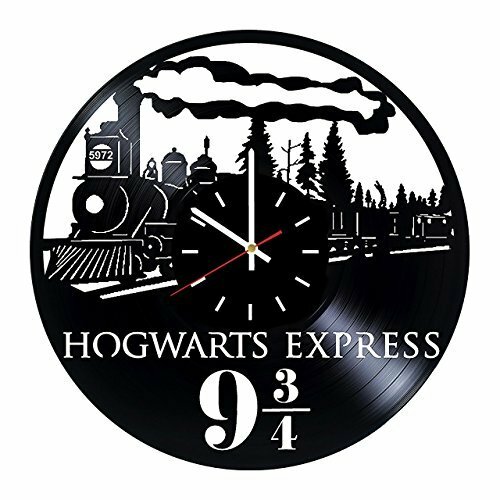 We will need around 2-3 working days to make you vinyl record wall clock and send it to you. Then it takes around 7-11 working days to be delivered to you. Tracking number is provided. We will refund you the money or send you another clock free of charge within 30 days after you receive the clock in case the clock comes broken. Please provide pictures. Your little piece of art is waiting for you. Don't doubt! MAKE AN AMAZING PRESENT - Wanna make a unique and original gift - impress everybody with handmade vinyl record clock! UNIQUE COMBINATION OF MODERN ART AND VINTAGE STYLE - Vinyl Record Wall Clock is a perfect home decoration and will suit any design and interior! If you have any questions about this product by choma, contact us by completing and submitting the form below. If you are looking for a specif part number, please include it with your message.